Maybe you've got a last minute business trip, or maybe you decide to sleep over at a friend's place on a Friday night. 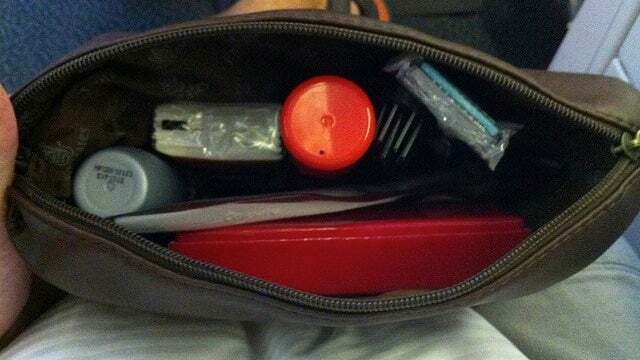 Whatever the scenario, it helps to have a quick bag of travel essentials on hand that you can grab before you go. Photo by jenny cu. Instead of packing and unpacking your toiletries over and over again, while chasing around the apartment unplugging cables, have a bag with TSA-friendly 3.4-ounce [85g] bottles of toiletries, as well as an extra set of cables and chargers for your devices at the ready. I've had one of these for ages, and it makes packing really easy. Rather than list and gather all the toiletries I need to bring, I just shove my grab-and-go bag in my suitcase. Mine is a transparent and filled with sample-sized bottles of toothpaste, deodorant, lotions and so on. This makes it easy to carry it through security at the airport. But it's also convenient for weekend trips with friends or even camping trips. I just grab my toiletry bag and a change of clothes, and I'm ready to go, without having to pack an entire suitcase. Business Insider offers a few more quick packing tips, so be sure to check out their full post.